Snowshoers trek through Chris Park north of Durango during a Winter Discovery Walk put on by San Juan Mountains Association. While they’re making their own tracks, outdoor recreationists can look for animal tracks and other signs of wildlife during the winter months. Southwest Colorado offers many recreational activities in the winter. From ice climbing to skiing, snowboarding, snowshoeing and snowmobiling, you can do it all in our little corner of the world. While some of these activities are faster-paced than others, try to take some time this winter to slow down and appreciate our natural winter wonderland. There are countless natural things you can discover in the outdoors this winter if you’re willing to look. Winter is a great time to look for animal tracks. Tracks of the snowshoe hare, for example, typically can be seen even when the hare itself may be camouflaged with its new coat of winter white fur. Because hares hop by landing with their back feet in front of their front feet, their tracks will show two large, long track impressions in front of two smaller, off-set tracks. If you’re lucky, you could even see some tracks of the Canada lynx, reintroduced to Colorado in 1999. Lynx tracks are quite large – about 5 inches across, compared to only 2½ to 3 inches across for a bobcat. In fact, lynx tracks are about the same size as a female mountain lion. If you look carefully, you may even be able to see some small mouse tracks on the snow, as well, with a small line in between the feet showing where its tail drags. Although winter is not a time that many people think of to look for birds, there still can be plenty of bird-watching around. Many birds, such as pine siskins and juncos, can be more easily seen at the lower elevations they migrate to this time of year. Winter also can be a nice time to spot raptors in trees that have lost their leaves. Bald eagles can be seen next to areas of open water earlier in the winter. Raptors such as red-tailed hawks and even smaller ones like kestrels can be found in trees, watching the ground for the movement of a mouse or other small animal below. The Christmas Bird Count in Durango already is done, but the Cortez Bird Count will take place on Thursday, starting at 8 a.m. at the Cortez Cultural Center. Join other birders, from beginners to experts, for this annual tradition. When was the last time you really looked at the trees you are using as ski obstacles when you’re flying down the slopes? You’re probably cruising around some gorgeous evergreens such as subalpine fir (short, flat, smooth needles), Engelmann spruce (soft square needles), Colorado blue spruce (found at lower elevations than Engelmann spruce) or even some aspens with their gray bark complementing the winter-white background. 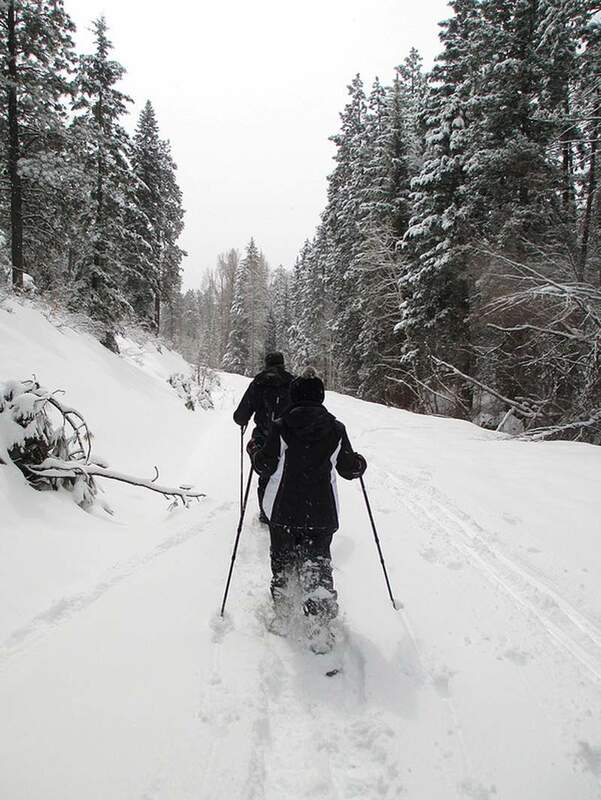 Surviving the Snow Season at La Plata Canyon, 10 a.m.-noon Jan. 2; call 385-1288. Plant and Animal Adaptations at Morefield Campground (Mesa Verde), 9 a.m.-noon Jan. 11; call 529-4631. Sensing Winter at Boggy Draw, Dolores, 10 a.m.-noon Jan. 18; call 385-1256. Visit www.sjma.org or www.nps.gov/meve for more information. Next time you’re riding the chairlift, about to start up your snowmobile or putting on your snowshoes, stop and take a moment to take in the beauty of winter in Southwest Colorado. You’ll be glad you did.